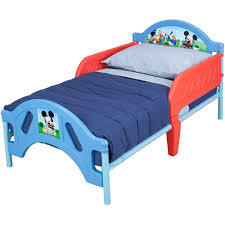 The Disney Mickey Mouse Toddler Bed is perfect for transitioning your little one from a crib to a big bed. With a high-quality plastic and metal frame, this Disney toddler bed is lightweight yet sturdy for strength and durability that will last. The Disney Mickey Mouse Toddler Bed is built low to the ground for easy child access and comes with side rails for safe and secure sleeping. The cheerful Mickey-inspired design theme featuring your child's favorite Disney character on the headboard and footboard make it a must-have. The Disney toddler bed uses a standard crib mattress, and a matching toddler bedding set is available (both are sold separately).